I love to snowboard. 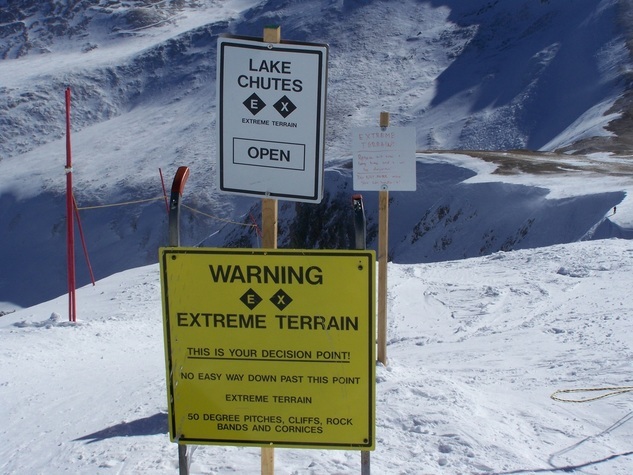 I took the photo above during a very difficult hike up to 14,000 feet (it was too high an altitude for a ski lift). When I reached this point on the mountain, it became clear that I could turnaround and take the easier way down, or continue on very extreme and difficult terrain knowing that it wouldn't be easy but the ride down the mountain would be worth it. Leading an organization is sometimes like this - taking calculated risks, paying close attention to the details, challenging others around you to achieve excellence and going for the best possible "ride". Over the years I have implemented a variety of concepts to move organizations to the next level. The following eight leadership concepts are time tested and will work. I have provided a summary of each concept. Feel free to contact me for the details on how to implement the concepts. Concepts #1 through #4 are good starting points for a turn-around situation. The concept is simple - instead of spending energy and resources on the "next best thing", take what you are currently doing and make it better. This involves a candid evaluation to remove the imperfections. In some cases very small and subtle improvements is all that will be necessary. But understand that the concept of refinement is one that involves action. It also assumes that the product, service or process is one that should be kept in the first place which is why a candid evaluation is necessary. Maximization and Concept #1 (Refinement ) are used simultaneously to jump start a troubled organization with the goal of creating early successes that can be celebrated. It can also set the tone for your leadership. With the concept of maximization, the idea is to take everything that the organization is currently doing and work to improve it BEFORE starting any new initiative or product launch. This of course assumes that what you are currently doing is relevant which is why I always recommend a candid assessment of the organization as a first step. Explaining this concept to the organization sounds something like this: ﻿﻿﻿"We need to focus on our core competencies before pursuing new initiatives. As I have assessed what we do and where we are, it seems that we are in a place called Time 1. Because we are in Time 1, we need to focus our efforts to maximize what we are currently doing so that we can achieve a place in time called Time 2. When we reach Time 2 we will have maximized everything we do and the fun will really begin as we develop new initiatives." ﻿﻿ ﻿I have found that different departments or locations of the organization move from Time 1 to Time 2 (maximization) at a different pace. This is not unusual and actually serves as a motivating factor. Who wants to work in an environment where everyone can't wait to leave at the end of the day? This concept involves fun in two different environments: the office environment and events outside of the office involving your staff and their significant others. As an example, we have ten operating units. Three times a year (summer, spring, winter) we have fun competitions where full and part-time staff attend wearing their location's colors. I can tell you from firsthand experience that having the CEO play along side all levels of staff creates a feeling that the leader is human and cares about staff and their families. It is also a great way to see who has a competitive spirit - you can learn a lot about your staff during a flag football game! Every organization will need this because it is common, especially in turn-around situations. Here's the analogy: I ran the 400 and 800 in high school. Both of these events are sprints which require full effort the entire way. At our track we had a huge tree that hung over the middle of the final turn. The saying was, "when you hit that final turn you need to run as fast as possible (this is also the time when you would be most likely to hit a wall - we called this catching rigor mortis, or "rig" for short) because there are monkeys in the tree and you don't want them to jump on your back and slow you down." In the work environment sometimes staff members make their problems your problem which equates to putting the monkey on your back. This slows the organization down and creates an environment of dependence which can paralyze. Creating a culture where everyone turns THEIR problem into solutions will avoid "catching rig". Your job as a leader is to help staff members think through various alternatives and solutions so that they learn to be independent thinkers, but understand if they need advice that the door is always open. By doing this you will add value to their jobs and create an environment of trust. These next concepts are used to take the organization to the next level. 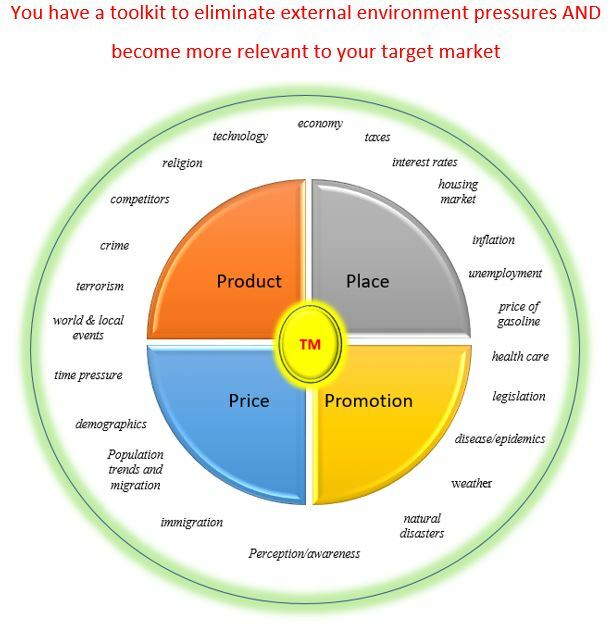 - A precise and detailed description of the Target Market for your products or programs. - Strategic "construction" of the Four 4Ps to be a direct match with the precisely defined Target Market. The Four Ps are variables that you can directly control and design to insure that what you are offering is a direct match with your Target Market. It has an important second benefit - the Four Ps are also used to counteract external elements that you cannot control but can counteract. Examples of external elements include: competitors, unemployment, inflation, recession, weather, crime, etc. Here are the Four Ps which you have full control of: 1) Price, 2) Product, 3) Place, and 4) Promotion. There is much more to this concept, including a way to design/construct each of the Four Ps. The key is to make this part of your staff culture. 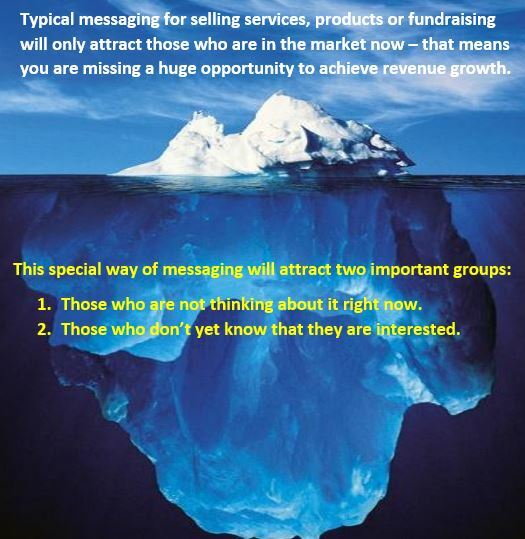 Once everyone understands and can apply this concept, both product/program development and earned revenues will soar. Simply put, this concept involves not stopping at the first right answer when faced with decisions and questions about direction, problem solving or new product development. Using this concept will challenge your staff to think out-of-the-box and not settle on a decision that is mediocre or "the usual". It is a great way to involve other staff members who are not usually part of the decision-making process and will eliminate group-think. As a result of using this concept you will continue to generate a series of "next right answers" until all of the alternatives are exhausted. This insures that the absolute right answer will be the outcome. The best way to describe this concept is to say that if fully implemented, your product or service will no longer be considered as a commodity in the mind of consumers. It involves expanding the potential consumer base because you have educated them on the important, life-changing benefit of your product/service and why they need what you are selling. This includes providing research that becomes personally motivating for a decision to purchase (it also is used in the Four Ps concept). More prospects will be generated because it will result in an expanded marketplace beyond the "ready to buy right now" group. Two types of consumers, those who "were not thinking about it" and those "who don't think they need it", will now be open to considering what you have to offer. This concept is also a good fit for fund-raising efforts. As with the majority of these concepts there is very deliberate and defined work that needs to be done to create the concept for implementation. All of these leadership concepts will work. But without the fundamental concept of trust at the top of the organization (the CEO and the senior leadership team) success will be short-lived. This involves having a genuine concern for both the organization, the people the organization will serve and the staff members who work hard every day to make it great - and this includes ALL of the staff members, from full time to part time. Trust is earned. As a leader, it is your job to do and say things that cause trust to be evident. It is also your job to insure that the senior leadership team is doing the same. It takes dedicated effort to create trust among the workforce, but all good things are worth the effort. With a focus on Servant-Leadership (a concept that involves leading through serving your staff) the organization will have the platform to achieve excellence.